Capsid assembly: refers to the formation of the capsid shell. Packaging: refers to the viral genome placement inside a capsid or an envelope. 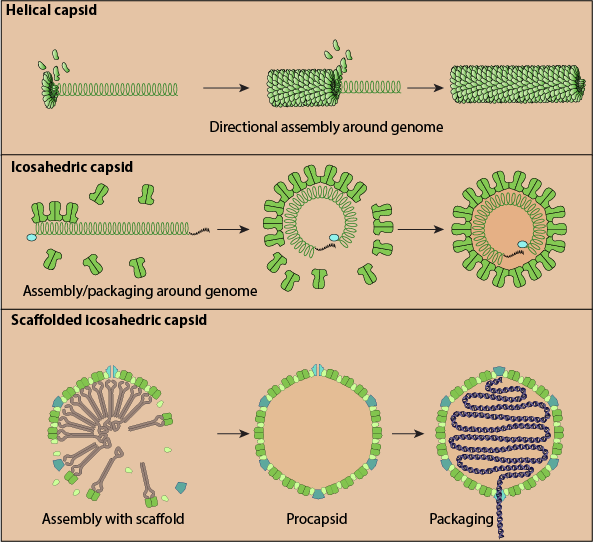 Most viruses capsid spontaneously self-assembles around the viral genome in the cytoplasm, thus linking the assembly and packaging process. Helical capsids are assembled around genomic RNA or DNA, and rely on self and nucleic acid interactions to assemble. Assembly and packaging are linked. -Negatives stranded RNA viruses genome is concomitantly encapsidated during replication. The packaging of these viruses occurs prior budding at the plasma membrane . Icosahedric capsids usually assemble by affinity around the viral genome. Complex capsids need the help of scaffolding proteins to assemble into empty procapsids . The scaffolding proteins are removed from the empty capsid by maturation events before packaging . -Nucleo-Cytoplasmic Large DNA viruses (NCLDV) contain an internal membrane, consequently they have a complex and regulated assembly mechanism. Poxviridae capsid-like protein is removed before virion maturation and serves as a scaffolding protein . -Reoviridae and Totiviridae have their capsid assembled around messenger RNAs that are later replicated into genomic dsRNA, thereby hiding the dsRNA from cellular antiviral sensors.